From Marquette to Munising, there are two alternate routes. Michigan 28 is the most direct and runs largely along the lakeshore. Waterfall seekers may want to take the longer route, via US Highway 41 and Michigan 94, to stop at Laughing Whitefish State Park to see the water fall. This route also takes you past the waterfalls located to the south of Munising. From Munising to Whitefish Point on Whitefish Bay, traveling becomes more complex. The road that stays the closest to the lake (Highway H58) is 90% a sand forest road, with occasional spur sand roads to get to the lake or campgrounds. So plan of collecting some dust if you elect this route. The bonuses are more lake views and some very nice rustic campsites that can only be reached via this route. One we really liked was right on the lake between Grand Marais and Deer Park. Otherwise you'll be traveling on Michigan 28 and then taking paved spur roads north to selected on-the-lake locations - like Grand Marais, Muskallonge State Park, and Tahquamenon State Park. One traveling bonus of taking the longer, paved route is you travel close to the Seney National Wildlife Refuge. Only a few miles south of Higfhway 28 at Seney, it has hiking trails plus an "automobile" nature trail, a decent size visitor center-educational exhibit, and even canoeing opportunities. From Tahquamenon Falls east - Whitefish Point, Paradise, Bay Mills, to Sault Sainte Marie - you have paved roads that run largely along the lake. Marquette's early settlement was due to the discovery of large masses of iron ore nearby in the 1840s. It was officially incorporated as a village in 1859 and a city in 1871. The city and its residents have done a great job preserving the old historic brownstone buildings. It is the Upper Peninsula's largest city with a population a little over 20,000. 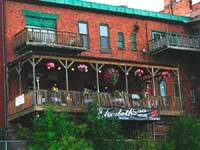 Elizabeth's Chop House, overlooking the Marquette Harbor, is one of many restaurants and pubs in the historic waterfront district. While mining remains part of the economic picture, the city is clean, with lots of big trees, well maintained residentail neighborhoods, and nice wooded parks. 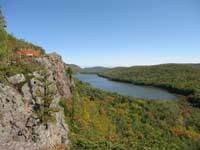 See our Marquette page for pictures, visitor information, events in Marquette, MI. Big Bay is located 28 miles north of Marquette along Lake Superior at the end of County Road 550. The road essentially ends at Big Bay so if you go there you'll need to back-track to Marquette to continue your Lake Superior Circle Drive. In 2005 we traveled the UP in our new Rialta mini motor home, rather than tent camping as we have done for many years. Since this mode allows us to overnight practically anywhere, we decided to go all the way north of Marquette to visit Big Bay and see what it had to offer and perhaps stay overnight at a campground or boondock since we were self-contained. Our recommendation on visting Big Bay. Unless you are hiker, kayaker, mountain biker or fisherman who plans to spend a few days there, I recommend taking a pass on the trip. The road, while paved, has several miles of potholes and broken pavement. And most of the stretch is too far from the lake for any scenic compensations. It was a long and boring trip that we had to repeat on the return trip since Big Bay is at the end of the road. But if Big Bay is your destination because of the aforementioned interests, then what it has to offer is worth the price of traveling the rough road (which I guess serves to keep the riff-raff out, eh?). The shortest route between Marquette and Munising is Michigan 28 running along the lakeshore. However, on our first trip, we didn't take the route. Instead we continued south on US 41 to Michigan 94 and then east to Munising. This was so we could hike into to see Laughing Whitefish Falls at the park of the same name. A one mile hike to the falls. It has a nice set of stairs and trails around the falls so you can get a view from many angles. 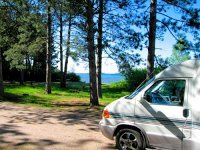 If you elect to take the Lake Superior route from Marquette to Munising (Michigan 28) and you are a camper or RV er, you might want to check out Gitchee Gumme Campground. They had high praise from one Circle Tour traveler: "This is a campground you should visit just for the experience. Ranger Jeff, host and owner of the campground seems to be quite a brilliant craftsman. His unique touches on the campground will keep your eyes looking for more. . . . Nothing goes to waste and everything has some sort of use. A really fun place to stay. " In addition to being the gateway to Pictured Rocks National Park, Munising is known for its 4 waterfalls within 5 miles of town. The one we liked the best was Munising Falls. It is actually located within the Pictured Rocks National Lakeshore Park. The hike to the 50 foot high falls is a half mile on a well maintained trail. Another pretty falls is Wagner Falls. Learn more about visiting Munising, MI and its Waterfalls. Pictured Rocks is backpacker and backcountry hiking paradise. In addition to back country camping, there are 3 drive in campgrounds as well as some accessible day hiking trails. Once you've explored Munising and the west end of Pictured Rocks, there are options to consider for routes to continue your journey east. If you want to sample more of Pictured Rocks, forest highway H58 runs northwest along the southern perimeter of the park. From that road, spur roads lead into the park, either to hiking trailheads or campgrounds. Eventually you'll arrive at Grand Marais, the town that bookends the east terminus of Pictured Rocks. For years ther downside of this route was that the road changes to sand/unpaved and it meanders around quite abit. It took about twice as long to get to Grand Marais than we had guessed. But just recently the entire route has been paved. And it looks like it would be a good route option during fall color time. If spending time on a winding forest road isn't your idea of a good time then option 2 is to get back on Michigan 28 and continue east until you get to Seney. There you'll intersect with Highway 77. 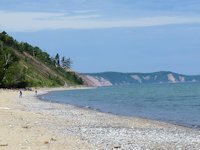 Take that north to Grand Marais and explore the east end of Pictured Rocks (Grand Sable Dunes, Sable Falls, and more). 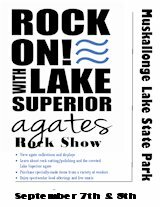 Here's a national park service map (Adobe PDF file) on the Pictured Rocks Lakeshore Park that gives you an idea of these two route options. 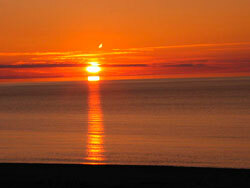 East of Grand Marais, but away from the Lake, is another stop we recommend. Tahquamenon Falls State Park has Michigan's most impressive waterfalls, some nice hiking trails, and two modern campgrounds along the Tahquamenon River. If you are adventurous you can continue on H58 east along the lakeshore to the town of Deer Park and then go south to the state park. But H58 soon loses its paved status and turns into a sandy, washboard road. You hit pavement again at Deer Park. So the more comfortable route is to go south again on Hwy 77 from Grand Marais, then go east on Michigan 28 until the turn off to the town of Newberry. Then go north on Hwy 123 to the park. There are handicap accessible paths leading to the falls and adjacent to the river. After you've hiked around the Upper Falls area, you might enjoy stopping in the Tahquamenon Falls Brew Pub & Restaurant. While it might seem the state is operating this fancy establishment, it is actually a private concession on private property that just happens to be adjacent to the path leading to the Upper Falls. How this came about was the land immediately adjacent to the falls was in private hands for several years and existed side by side with the then existing state park. The deal that brought the falls into the park included the right of the owner to operate his enterprise and have ingress and egress through the park lands. After a hot day of hiking, this is a welcome amenity! While the Upper Falls are quite impressive we also found the Lower Falls area quite enchanting. There are several smaller falls that cascade around a large island. You can rent rowboats and canoes here too, paddle over to the island or get a closer view of some of the falls. 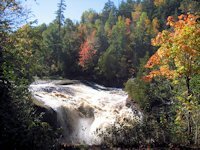 See our page of pictures and information on Tahquamenon Falls State Park, camping, hiking, and waterfalls. East of Tahquamenon Falls is the town of Paradise. Before continuing south and east towards Sault Ste. Marie we recommend taking the spur road north of Paradise to visit Whitefish Point. Of interest there is the lighthouse, coast guard station, Great Lakes Shipwreck Museum, and the migrating bird observatory. There are hiking trails, a boardwalk, an extensive sand beach you can walk along that has a panaromic view of Lake Superior. A little south of Paradise on Hwy 123 you intersect with the Lake Superior Lakeshore Drive (now called the Whitefish Bay Scenic Byway). That is the scenic route to Sault Ste. Marie as it runs adjacent to the lake. There's several nice wayside stops or picnic areas along this route as well as a national forest campground. One worthwhile rest stop along this drive is the Point Iroquois Lighthouse.